Taapsee Pannu and Bhumi Pednekar have movie marathon break at a local theater in Meerut! 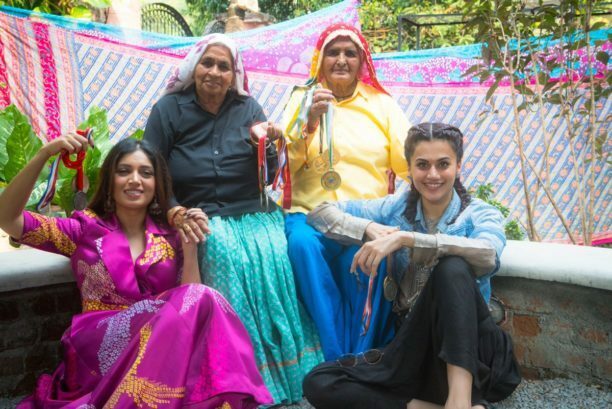 Taapsee Pannu and Bhumi Pednekar have been busy shooting for their exciting film Saand Ki Aankh in Johri, Uttar Pradesh for the past two months. The two brilliant actors have been hard at work making sure every frame and shot is perfect. However, everyone needs some time off and the the two stars plus the unit of the film had a very cool and very filmy break. Recently during this special day off they made the most of the day by indulging in a movie marathon at a local theater in Johri. Their day consisted of watching three movies back to back. “It was a different experience to watch movies here as we are so detached from our lives in Mumbai,” gushes the actor. In Saand Ki Aankh Taapsee Pannu and Bhumi Pednekar will be seen playing the world’s oldest sharpshooters, Chandro Tomar and her sister-in-law Prakashi Tomar in the Anurag Kashyap produced film directed by Tushar Hiranandani.